When I left the house tonight, I had every intention of going to the gym. But instead of pumping iron, I found myself on a dark street corner with the Meat Man. Uh-oh, that sounds bad…. But don’t worry, this is a G-rated post, I promise. On my way to LA Fitness this evening, I passed a guy selling meat out of the back of his truck. Eureka!, I thought as I stomped my brake to the floor. Mobile meat stores like this one were the inspiration for Potter Pete’s Meat Wagon in Honk If You Hate Me, but I hadn’t spotted one in my neighborhood for over a year. My editor doesn’t believe me that such trucks exist, at least not in the suburbs of San Diego. I needed proof, and this was my chance to get it. Turns out I needn’t have rushed. The Meat Man was making a sale at a house up the street. I had plenty of time to take my picture. And plenty of time to chat with the Meat Man’s assistant, who was kicked back in the passenger seat, his feet on the dashboard. Assistant Meat Man ended up being a really nice guy. Nothing like the creepy, mustache-twirling vagabonds I had come to imagine. And this meat wagon was nothing like the ramshackle, converted ice cream trucks that had prowled our streets in years past. 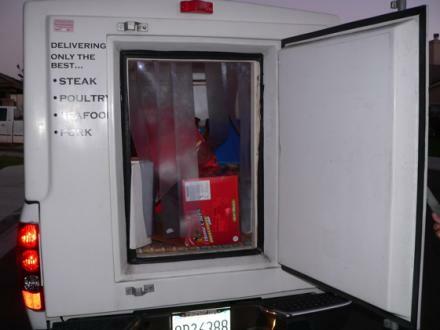 In fact, it was a rather nice refrigerated truck, designed for just such a job. 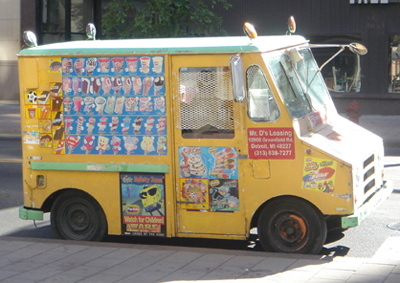 It lacked the strangely appealing fear factor of the beat-up, wallpapered, converted ice cream trucks that had inspired Potter Pete’s ride, but it still had its charm. And it did a brisk business. 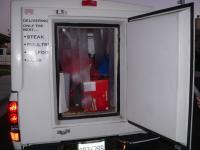 According to the Assistant Meat Man, the mobile meat business is so good that more and more meat trucks are cruising San Diego, forcing he and his partner to head miles out of town just to make a few bucks. And here our poor neighborhood had been neglected for a year. I felt almost grateful. Not that I intended to buy any meat from him. It just seems too weird to me. Meat comes from Vons. Or from Whole Foods when I’m feeling the need to be organic. It doesn’t come from door-to-door salesmen. Me being me, I was soon chatting with Assistant Meat Man about the writing biz. He loved that a meat truck was featured in Honk If You Hate Me. In the spirit of book loving, he not only let me photograph his truck, he threw open the back door for an interior shot. So there we were, standing next to stacks of frozen flesh, at a darkening street corner, talking meat and trucks and books . . . and movies. It turns out Assistant Meat Man is headed back to L.A. in a few months to resume his film career. He’s a movie producer, and he’d just had his big break, a movie called “Eye of the Dolphin,” which is in five San Diego theatres right now. Isn’t that funny? My meat guy just might be the next Stephen Spielberg. And he jokingly called me the next J.K. Rowling. Why, between the two of us, that street corner was hosting the next generation of entertainment moguls. If only! 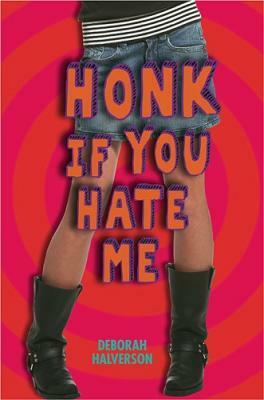 *“Honk If You…” is an occasional series about inspirations, backstories, and random stuff tucked into my teen novel Honk If You Hate Me. See, once you become a blogger you need to have your camera on you at ALL times. You never, ever know when a picture will be necessary!!! So, I am in San Diego, and we have an ice cream man with a lead foot in our nighborhood too! And we have a guy who sells meat from a truck! He knocks on the door once in a while, saying he’s “delivering to the neighbor and has some extra…” uh no thanks. 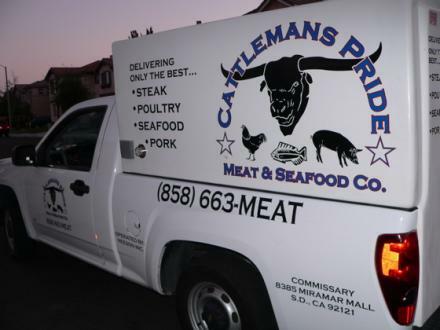 But tell your EDITOR, that yes in San Diego they sell meat in a truck.